Rett syndrome is a progressive neurodevelopmental disorder that occurs in 1 of every 10,000 births worldwide and is seen almost exclusively in girls. Rett syndrome is often misdiagnosed as autism, cerebral palsy, or non-specific developmental delays because symptoms do not usually appear until 6 to 18 months of age. Little girls with “classic” Rett syndrome begin to develop as usual, but then begin to lose skills they gained earlier, including speech. They also begin to develop stereotypic movements (like wringing their hands). Girls with Rett syndrome often have problems with learning, speech, sensory sensations, mood, movement, breathing, cardiac function, chewing, swallowing, and even digestion. So what’s life like for girls and women with Rett syndrome? Well, it’s often more normal than one might expect. Take Jessi, as an example – a 14-year-old girl from Decatur, Alabama who was diagnosed with Rett syndrome in 2013. Her parents had long known that her diagnosis of autism wasn’t quite right. After visiting multiple specialists, a neurologist suggested a genetic study, which revealed a mutation in Jessi’s MECP2 gene – the gene responsible for Rett syndrome. 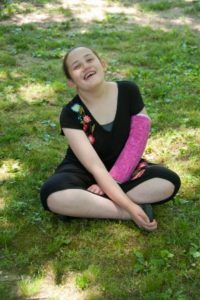 Jessi’s mother tells people that finding out about Rett syndrome was like, “no longer throwing punches in the dark.” Although Jessi is living with Rett syndrome and currently participating in a drug trial at the University of Alabama, her day-to-day life is like that of many teenage girls without the condition. She enjoys French fries, music, having fun in the water, and acting silly with her friends. Or Siera – a 28-year-old woman who is often mistaken for a young teen, most likely due to her smaller hands, feet, and head (caused by Rett syndrome). Her mother knew something was wrong when tasks once easy for Siera, such as feeding herself or brushing her teeth, became more difficult. Siera was diagnosed with Rett syndrome just months before her third birthday. Over the years, she has received ongoing occupational, physical, speech, and eating therapy. Siera says that it was never an option for Rett syndrome to determine her life or limit her, no matter what she heard, and that most days she feels like any other 28-year-old. Jessi and Siera act as beacons of hope for parents learning about a new diagnosis of Rett syndrome in their child. If you’re interested in learning more about Rett syndrome, visit ThinkGenetic for more information, answers to common questions, and more.